A few months ago I found a good deal on a used 12″ reflector. 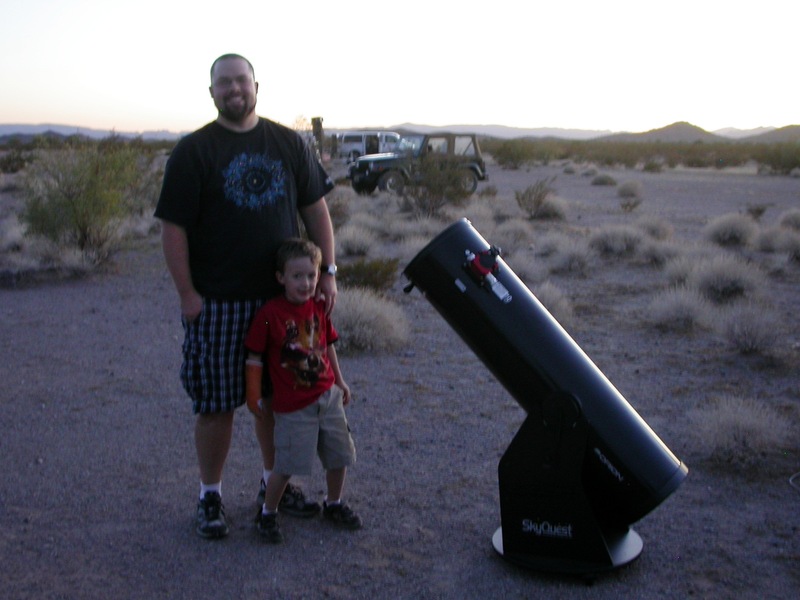 The guy selling the scope, Darrell Spencer, lives in Phoenix, and offered to drive part of the way for the handoff. We met at a diner on I-10 in Arizona and had a great conversation over breakfast. In particular, we talked about our favorite dark spots and the chances of meeting up to observe sometime. We parted fast friends, and both started scheming about how to meet up under dark skies. With the new moon, pleasant temperatures, and clear skies over most of the southwest, this weekend was a big one for star parties. Through various clubs and friends I heard of at least four here in SoCal, and I’m sure I would have had a great time at any of them. 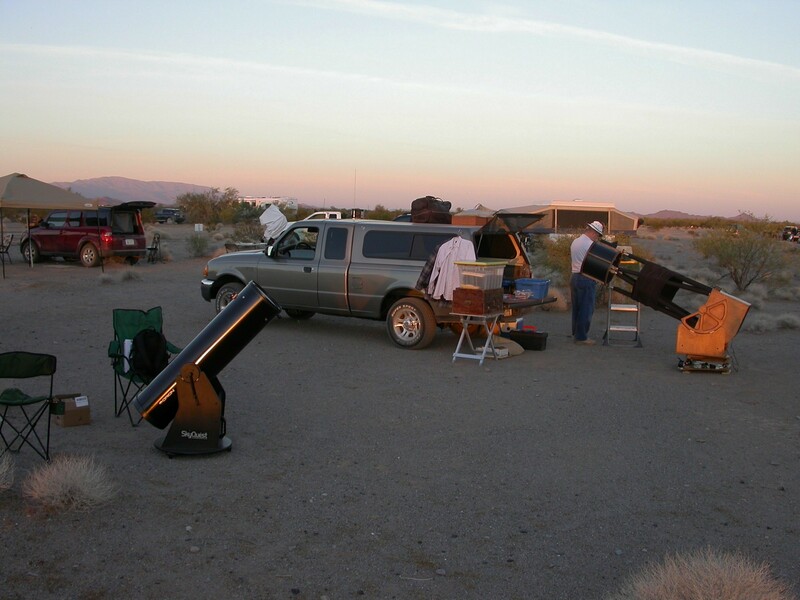 But the one I ended up attending, thanks to an invite from Darrell, was the All-Arizona Star Party, out in the desert about 50 miles east of the California border. Darrell didn’t know I was going to take this picture until about half a second before I clicked the shutter, hence the expression. The AASP was going on both Friday and Saturday nights, but I could only afford to do one night, and the forecasts called for Friday night to be a little bit better. I picked up London after kindergarten and we hit the road. We rolled in about half an hour before sunset, and found a spot next to Darrell. 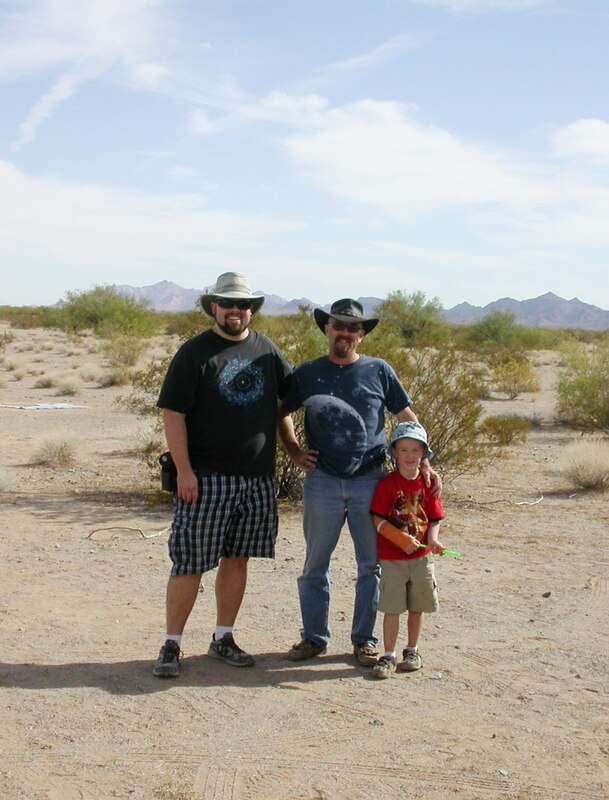 Steve Coe and AJ Crayon were set up on either side, so I was hanging out with some truly legendary observers. They also turned out to be darned nice guys. Here’s AJ’s truss dob cooling down on the right, with my XT10 on the right. There had been a few wisps of cloud in the sky when we pulled in, but as the sun set they evaporated, and by the time the first stars came out, the sky was clear except for a little fuzz over the Phoenix light dome, low on the eastern horizon. The last of the sunlight striped the western sky with some beautiful crepuscular rays. I spent the couple of hours just surfing around the sky, hitting some seasonal favorites. London looked at a few things but spent most of his time watching for satellites and shooting stars. 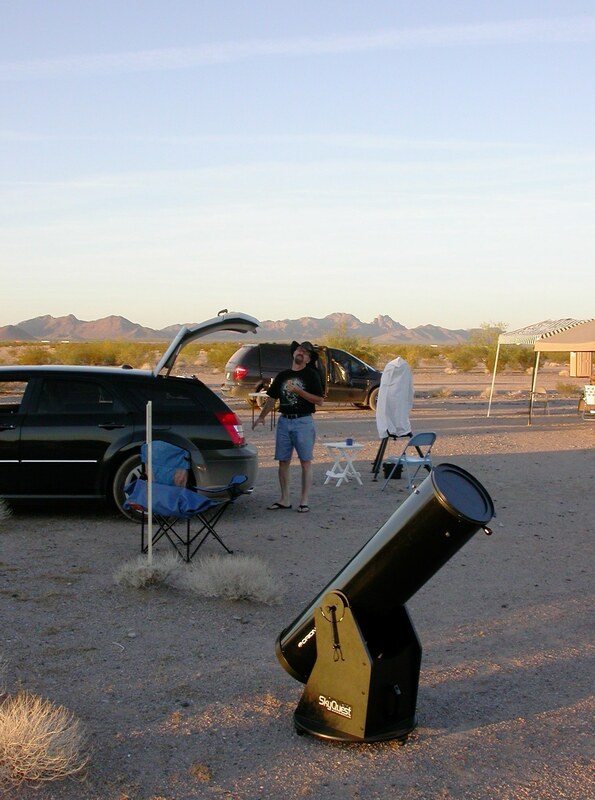 At 7:20 most people on the observing field stepped away from their scopes to watch the western horizon. There was supposed to be a rocket launch from Vandenberg, a Delta II putting up an Earth-observation satellite (here’s the story from the Vandenberg site). At 7:21 we saw a bright spark flying low over the western horizon. That’s what 100,000 lbs of thrust looks like from 300 miles away. It was the first time I’d ever seen a real rocket in flight. London was even more thrilled, if that’s possible. He also spotted a couple of satellites and shooting stars, so he got everything on his list. I had a list of my own to deal with. NGC 5982 and 5985 (H400): A nice pair of galaxies. At 92x, 5982 is a small bright round glow, like a miniature M32; 5985 is an elongate, dimmer smudge of light. Excellent pairing. NGC 1023 (H400): Big, bright, beautiful edge-on spiral galaxy, with clearly delineated core and bits of detail in averted vision. A minor showpiece! NGC 2261, Hubble’s Variable Nebula (Caldwell 46): Very cool V-shaped spray of bright nebulosity. Edges of ‘V’ are very sharp and crisp, and the middle of the fan fades out evenly. Not like anything else I’ve seen in the sky. NGC 2362 (H400, Caldwell 64): Open cluster. At 37x, almost perfectly triangular scattering of about 20 equally bright stars around a much brighter central star. One of the prettiest open clusters I’ve seen–better than many Messiers. NGC 2024 (H400): Big, detailed bright nebula adjacent to Alnitak in Orion. At 57x, looks like a ghostly version of its photographic appearance. Extremely cool. I was using my XT10 for almost all of my observations. I also had 15×70 binoculars along and they came in handy for working out a couple of tough star-hops and for observing IC 342 (Caldwell 5)–this galaxy is so big and diffuse that it was difficult to make out in the telescope, even at low power, but it was a cinch in the binoculars. But my favorite observation of the night, and one of my favorite observations of all time, was made with naked eyes. About 12:40 I leaned back from the eyepiece and just stared up. Right at the zenith, between the Pleiades and the constellation Aries, was a very large, faint, and diffuse patch of light. I called Darrell over to ask him if it was what I thought it was. He thought so, but wasn’t entirely sure, so we asked Steve Coe, and he confirmed it. We were looking at the gegenschein. The solar system is full of dust. Very little if any of this dust is left over from the protoplanetary disk that gave rise to the planets; that should have spiraled into the sun long ago. Most of what’s out there now is thought to have been “processed”: incorporated into planetesimals early in the formation of the solar system, and redistributed by meteor impacts, asteroid collisions, and the evaporation of comets. The planets do not revolve through empty space, but through a flat disk of dust that encircles the sun like a phonograph record. Under very dark skies, this dust is visible, for the same reason that the planets are visible: reflected sunlight. 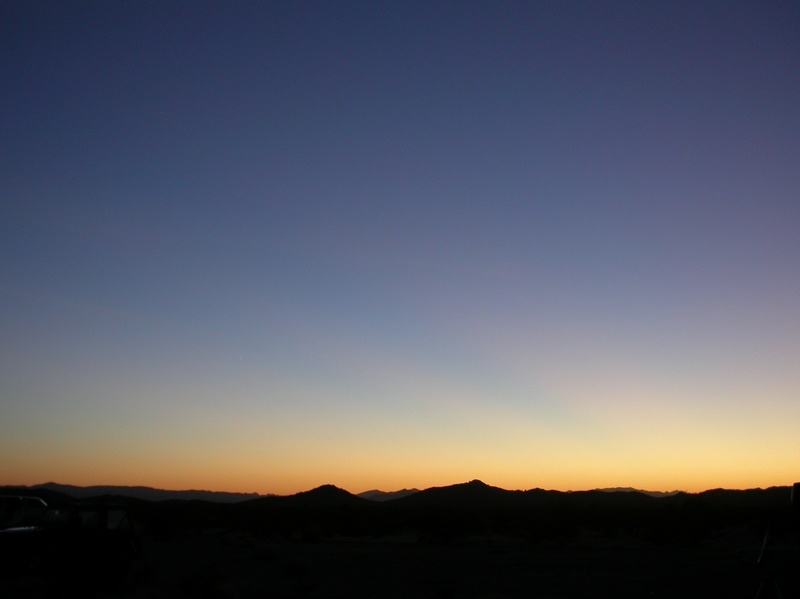 The brighter manifestation of the reflected dust-light is the zodiacal light, which stands up like a pillar from the horizon. It’s called “zodiacal” because the dust, like the planets, orbits in the ecliptic plane, which is projected against the background stars that make up the constellations of the zodiac. The gegenschein is another, dimmer reflection of sunlight off the interplanetary dust cloud. As the German term–“counter shine”–implies, the gegenschein is observed directly opposite the sun. Friday night the sun set a little after 6:00 PM, and Saturday morning it rose a little after 6:00 AM, so right after midnight the sun was directly behind us (as it always is midway between sunset and sunrise, wherever you happen to be). That meant that the dust grains right overhead were in full phase, the same way that the moon is full when it is opposite the sun in the sky. Darrell, Steve, and I saw this full-phase portion of the sun’s dust cloud as that glowing patch of light directly overhead. I had read about the gegenschein, but I had never seen it before. It is so faint that even the smallest amount of moonlight, haze, or light pollution will make it invisible. Seeing the gegenschein is a sign that you’ve been under some of the darkest, clearest skies on Earth. I pushed on to a little after 2:00 AM. I ended the night with 6 Caldwell objects, which pushed my total to 74, past the 70 required for the AL club. I also observed 27 objects for the Herschel 400, and re-observed at least 21 Messier objects over the course of the evening. The Great Nebula in Orion looked better than I have ever seen it–the nebulosity just kept going on forever and ever, and the patch around the Trapezium was incredibly detailed. I saw a lot of amazing stuff Friday night, but the gegenschein easily takes the cake. London and I have a deal on these camping trips: I observe all evening, and he takes me on a hike in the morning. 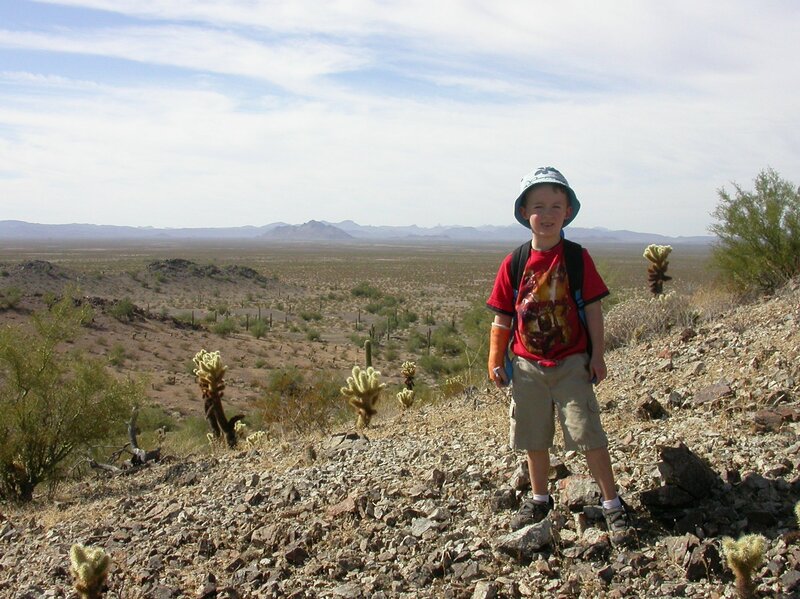 He told me that yesterday’s hike would be a “bone hike”, and we’d be looking for bones, spiders, and scorpions in the desert. There was a range of low hills about two miles to the west of camp. London was adamant that we were going to climb them. And so we did. The secondary summit of the hill on the left in this picture is the one we climbed. The entire hill was comprised of shattered rock and covered with cacti, and the farther we climbed, the worse it got, so we settled on the lower peak. The round trip took three hours and with all the winding around we did we probably walked five miles. I would not have thought my little man would have the stamina, but he was a real trooper. 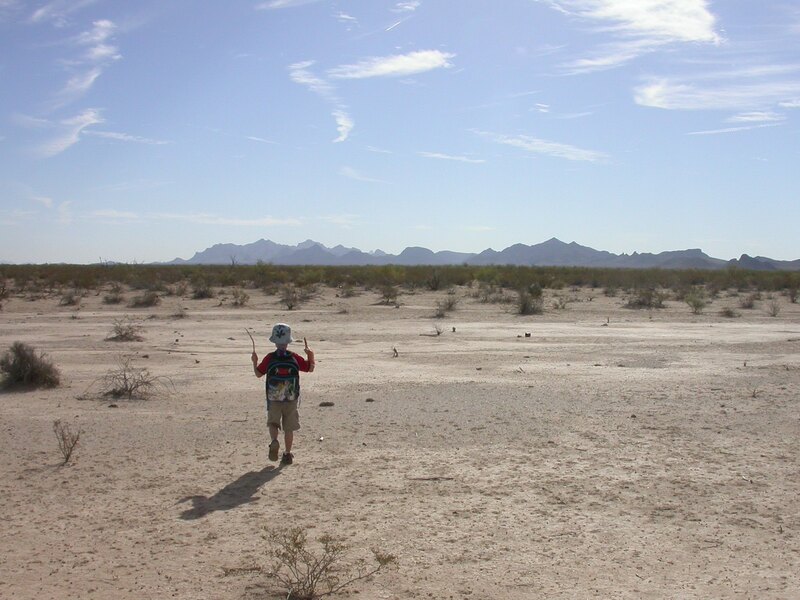 He had even packed up the water we’d need for the hike in his backpack. Not bad for a five-year-old! 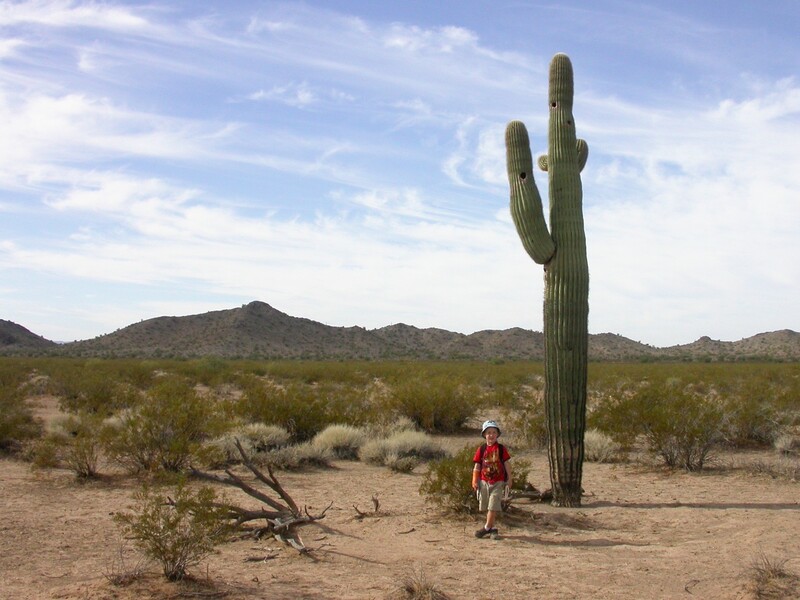 We saw plenty of cool stuff along the way: saguaro cacti, free-range cattle, a jackrabbit, ants of every imaginable size and shape, and lizards that zipped from bush to bush almost too quickly to see. London did find a spider–a baby tarantula that froze when we walked up–and a bone, the broken, sun-bleached tibia of a cow. So the walk was a success all around. 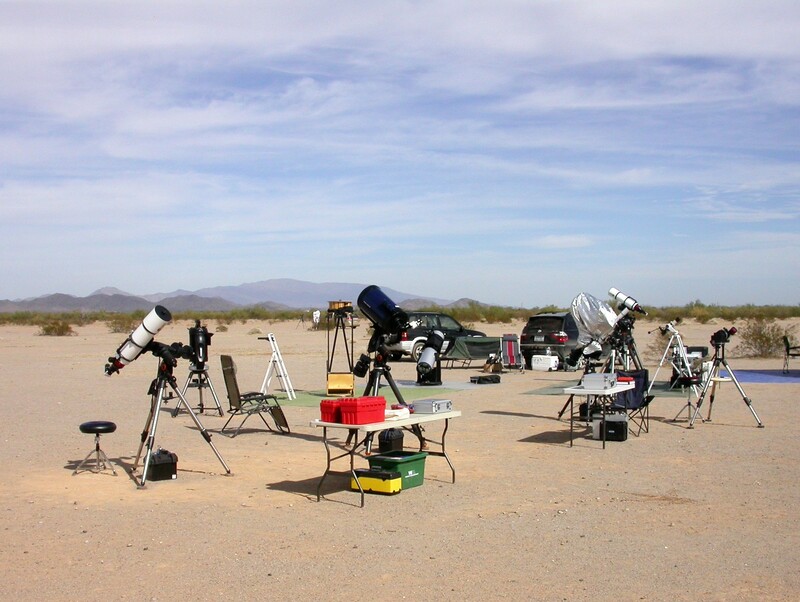 Fittingly, the Tuscon contingent at the star party had a bunch of specialized solar scopes set up on the sun. When London and I got back to camp, we went down to check out their setup. They invited us have a look. There was a bright active region and little spike-like prominences standing out from the edge of the sun like quills on a hedgehog. I say “little” prominences but the biggest were probably about as tall as the Earth is wide. It doesn’t pay to get too blase about anything up there, especially our closest star. It’s funny, when I’m back in civilization I spent too much time mooning over gear (New Year’s resolution notwithstanding). But when I’m out under dark skies, gear is the last thing on my mind. The telescope just gets out of the way and I am alone with the stars. It’s easy to slip into a productive rhythm–checking the charts for the next object, working out the star-hop, trying different magnifications to see which will make a given object show up best, taking some time to really look for details, recording my observations…sitting back to look around and just exult in the majesty of the night sky. The time flies by, always faster than it should. Strange, how thoroughly I can lose myself finding things in the sky. This weekend might have been the end of the fall star party season. California’s rainy season is upon us. There will be clear nights and plenty of good stuff to see for the next few months, but it will be catch as catch can. Still, I’ve had a great run this fall, and I can’t wait to see what’s next. You are currently browsing the archives for the Herschel 400 category.